fine food. 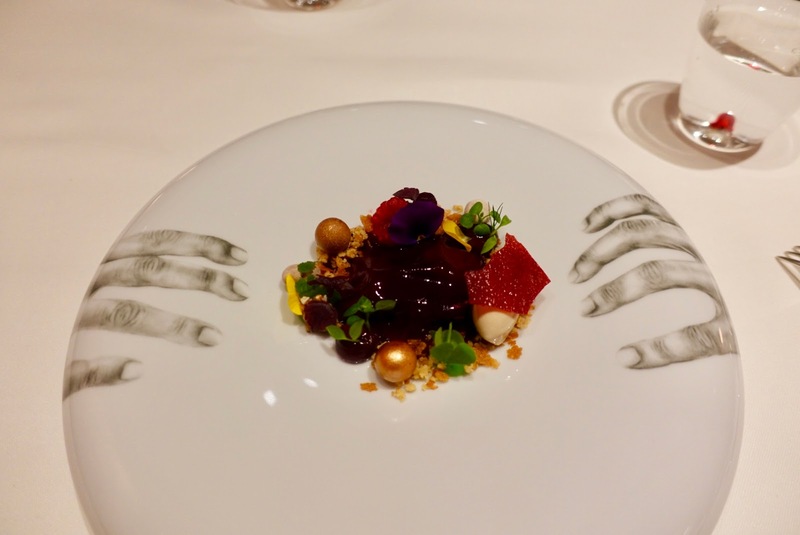 One of them and in the opinion of the most important restaurant guides the best spot for high-end dining is Restaurant Einstein Gourmet at Hotel Einstein. 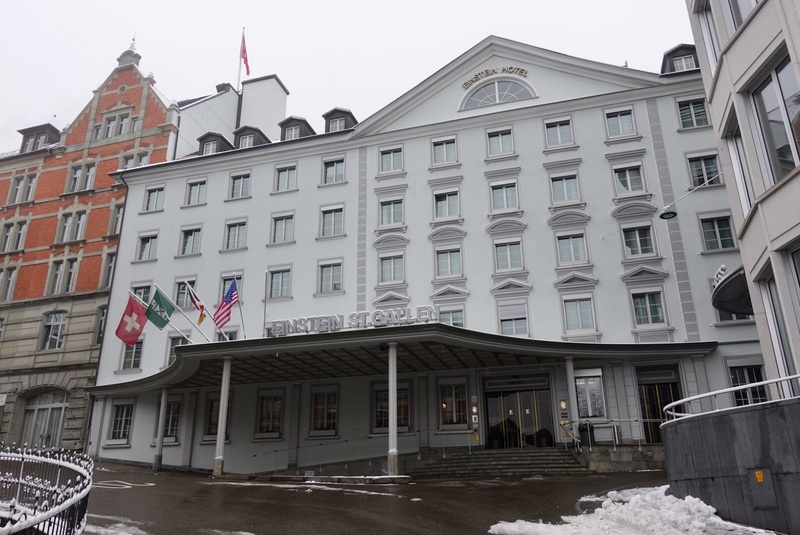 Before going into the culinary part, a few words to the town of St. Gallen and the Hotel Einstein, where the award-winning restaurant is housed. 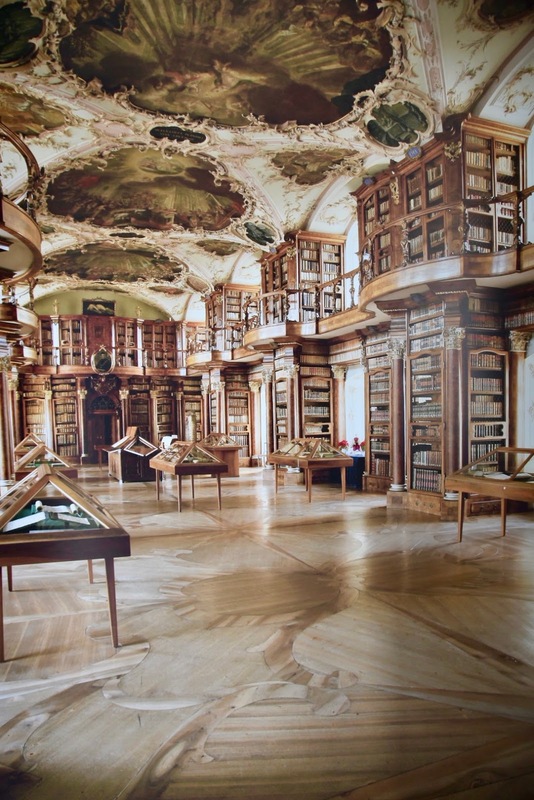 with a rich collection of ancient books and Switzerland’s most beautiful Rococo hall. 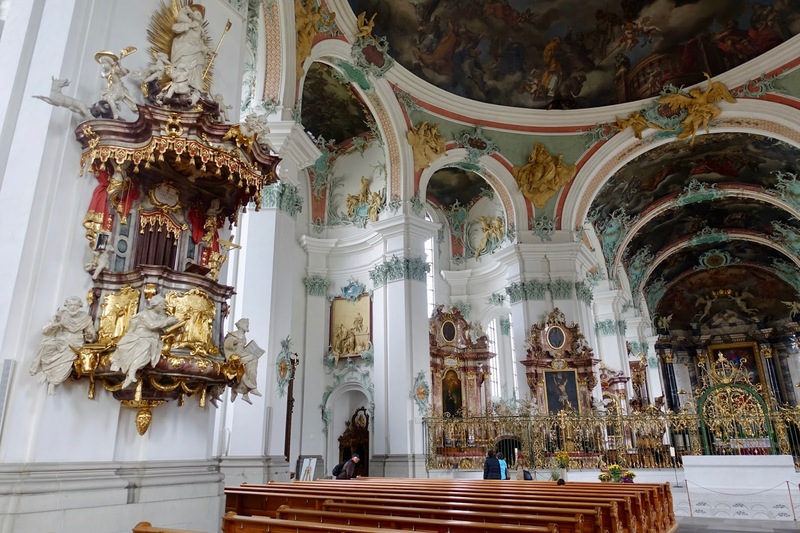 But also the old town, which is traffic-free, is a recommended place for a stroll with burgher houses having decorative bay windows. 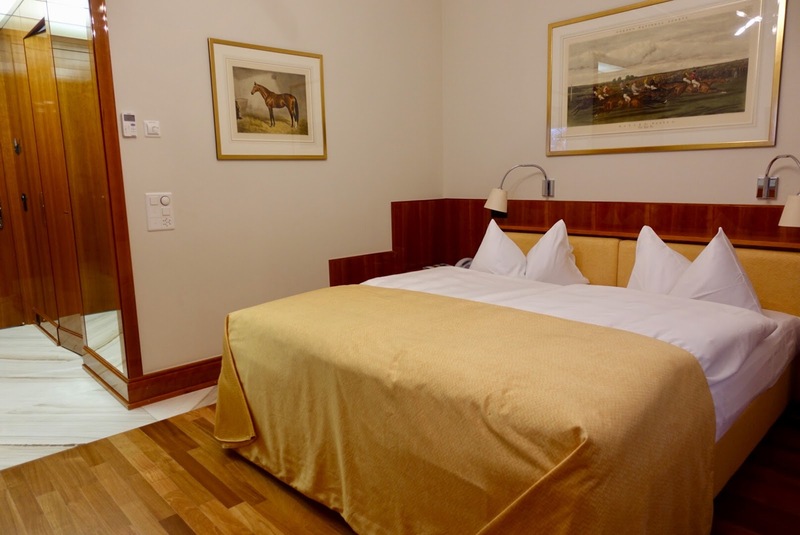 Hotel Einstein is by all accounts the top address for staying in St. Gallen, albeit it is more a place when traveling on business than as a couple. 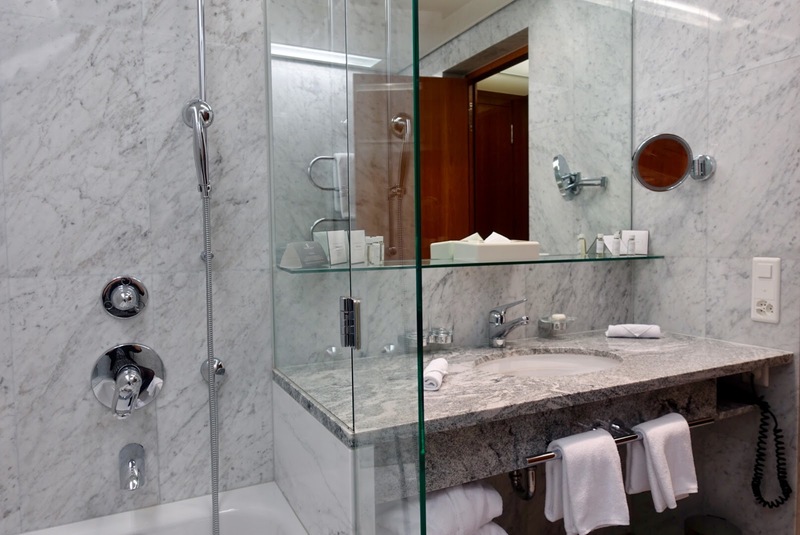 and adequately sized, granite-decked bathrooms (Superior Room). The public rooms are nicely designed with some interesting details. A great place to spend some time is the bar with a good vibe and an old-style décor. Now to the Restaurant Einstein Gourmet as the main reason for staying at Hotel Einstein was this fabulous dining-spot! 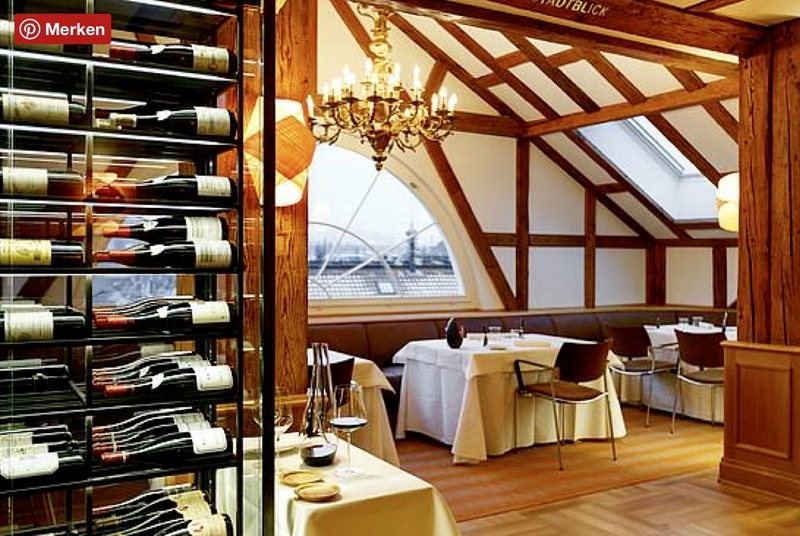 The restaurant occupies the entire attic of the Hotel Einstein, although not all the parts of it are used by this culinary hotspot. 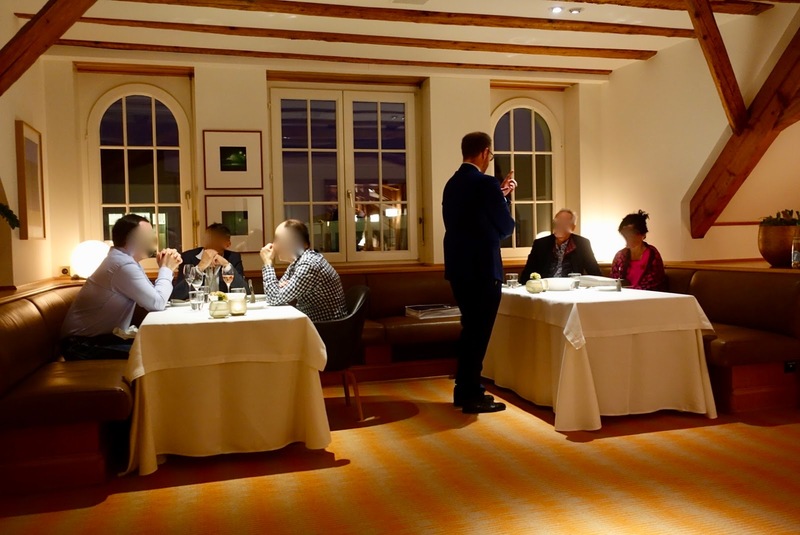 There is an area with tables and chairs, which is typical for a conference room and does not really seem to belong to the fine dining venue. You can clearly see that this restaurant is part of a convention hotel. As to the décor, it is kept in a rather rustic style with a lot of wood and a carpet flooring that is not especially appealing. One may call it cozy, it would be suitable for a classic fine dining restaurant but not for a place offering new taste experiences just as Einstein Gourmet does. As hinted already, culinary magic is performed here under the direction of two young German chefs in shared responsibility. While Sebastian Zier has the position of an executive chef standing for classic French cuisine (formerly Schwarzwaldstube at Traube Tonbach/Germany), Moses Ceylan with Turkish-Lebanse roots is the head chef bringing in the avant-garde element (formerly Noma, Copenhagen/Denmark). This cooperation works surprisingly well. The creations are perfectly executed yet imaginative to provide plenty of excitement to your tastebuds. European cooking is combined with Asian and Oriental influences and results in intriguing dishes standing out of the ordinary. Out of the 6-course set menu, our family opted for five of them. Several amuse-bouches, which activated all the senses, were a delicious start to a memorable meal. The first course was dedicated to the parsley root. It was paired with red currant, fennel and grilled lettuce. At the table, a delectable parsley root jus was added to the vegetarian dish, which made the whole a complex taste experience. The dinner was continued by a fish composition: half-cooked salmon was arranged on a bed of egg yolk noodles, spinach and potato. An exquisite tarragon beurre blanc completed the dish, which was one of my favorite ones here. 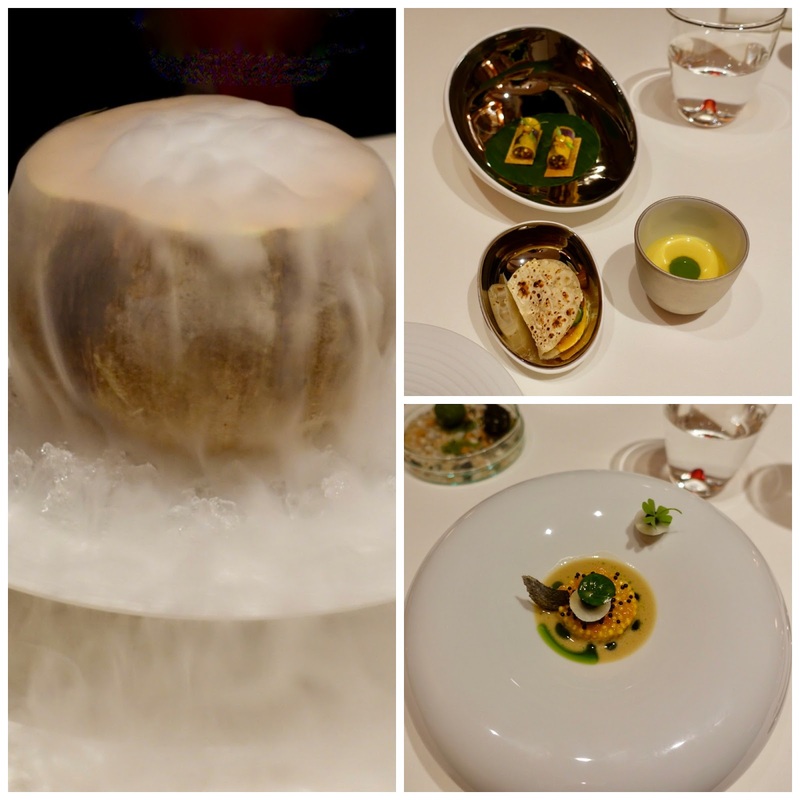 The get-together of flavors and textures left me deeply impressed. A typical French dish, Pigeon Royal, was served as a main, albeit all the rest was far away from being your normal French cuisine. The point was that it was accompanied by an inventive jus made out of chorizo. What a mind-blowing taste sensation! 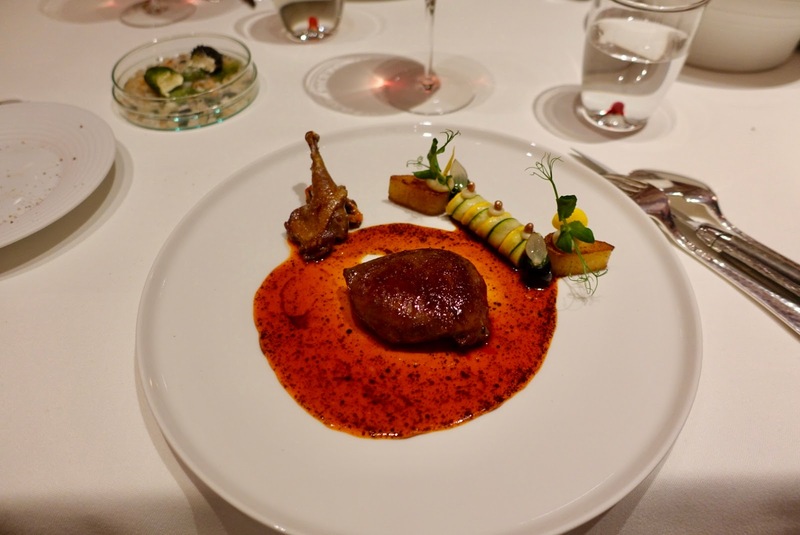 The pigeon breast was cooked to perfection and harmonized ideally with ratatouille “of the modern kind”. Nothing short of amazing was the dessert, a mélange of raspberries, shiso, buckwheat ice cream and beetroot. Each element balanced each other out ideally. Each bite was a bit different from the one before but without losing sight of the imperative of the composition as a whole. This great final dish was my other favorite! 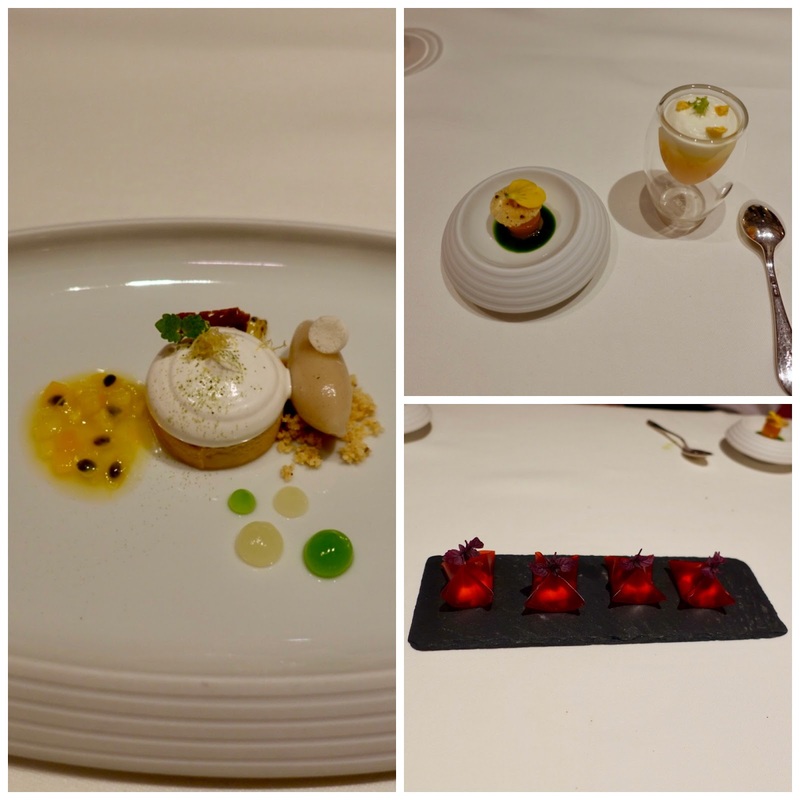 When going through the pictures of this dinner, you might have caught sight of the small balls that were added to the dishes now and then (as in the dessert). They deserve a separate praise as they always caused a flavor explosion in my mouth, an astonishing thing! 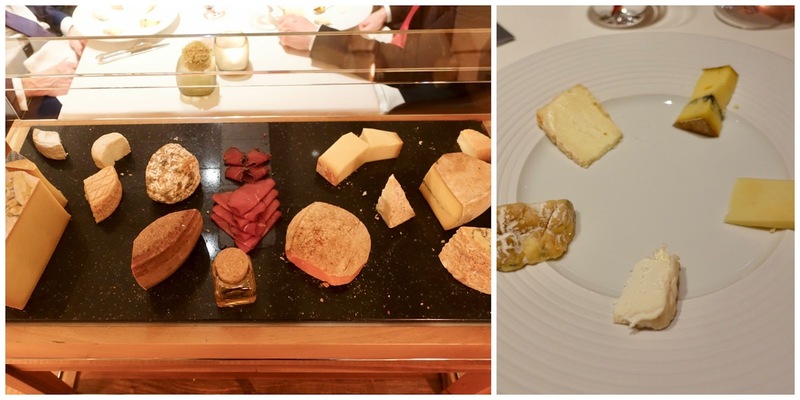 The sweet course was “framed” by small delicacies, which were a feast for the eyes and the palate likewise. All in all, I was in awe of all these expertly crafted dishes, which were refined, and original at the same time. Many of them will linger long in my memory! As pointed out, a duo of equal chefs is at work at Einstein Gourmet, and this since 2015. One advantage of this collaboration is that every now and then, one of them has the time resp. takes his time to emerge in the restaurant during the service. And they do this for the purpose of pouring a jus, i.e. in the first and in the main course. This arrangement even enhanced the already first-rate experience. In regard to the service, there was an issue at the beginning. We barely had time to settle into our seats when some (hot) bites were placed on the tables. 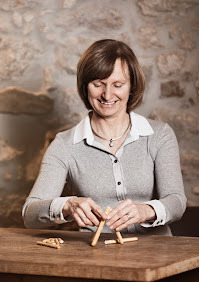 At this time, we were talking to the accommodative and competent restaurant manager/sommelier, Tobias Hess, who we knew from the restaurant where he had worked before. We were discussing with him which champagne to choose and he had a fantastic recommendation, Egly-Ouriet Brut Rosé Grand Cru. Unfortunately, we had to drink it with lukewarm nibbles, which was a pity! To our great relief, the evening did not take any further unexpected turns. But as you are certainly aware of, there is no second chance for a first impression! There is one menu at your disposal, from which you can choose four to six courses from 158 SFR to 198 SFR. 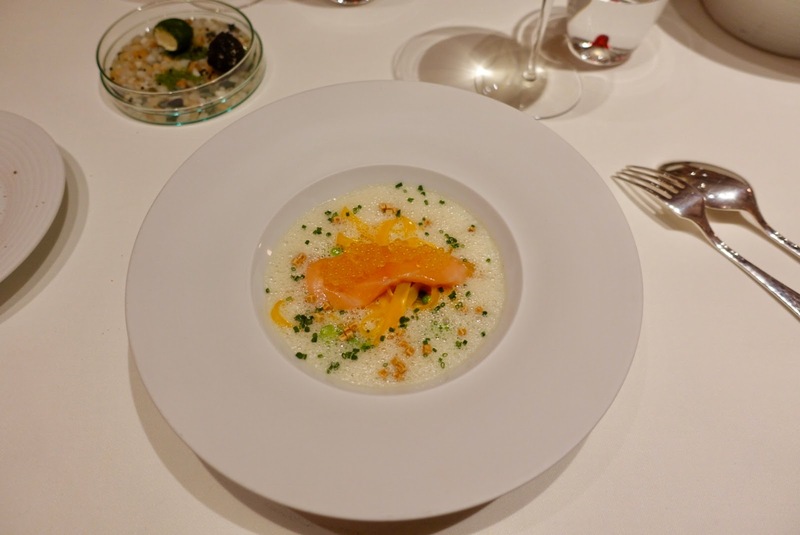 The prices are certainly at the high side, although they are competitive compared to other restaurants playing in the same league (two Michelin stars and 17 points Gault-Millau). Cooking this good does not come inexpensive and Einstein Gourmet is in this segment not even at the upper end of the price range. We thoroughly loved our experience at the Einstein Gourmet, the menu featured some of the most enthralling dishes we have had in a while. 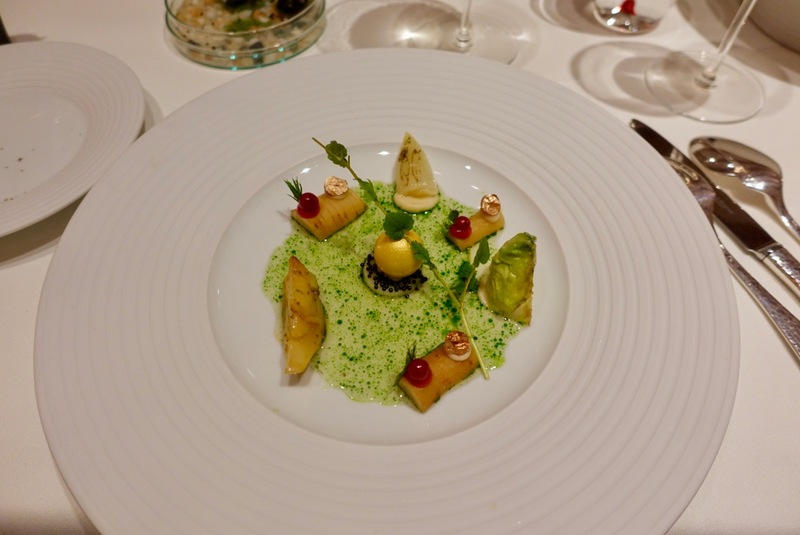 The most extraordinary aspect was in my opinion the tension between the classical French cuisine of Ziers and the avant-garde cooking of Moses and the result out of this, which was in my view at times daring – e.g. the combination of pigeon and chorizo – but always harmonious. A new and interesting approach was that the two likeable chefs made an appearance with their guests every now and then, and this not to talk but to perform a task in the first place.